When you wake to the sound of tropical birds, and soon find yourself sweaty from the heat and humidity, and when you look out over the palm tree tops to the Arabian Sea as you hear the Names of Devi wafting upwards from the temple below, it takes a little time before you register that it is the morning of Christmas Eve. You’ve come from half a world away, and left behind you there the tinkling of Salvation Army Santa Claus bells, the innocent voices of children carolling, the smell of pine trees and lebkuchen and nutmeg on eggnog, the glitter of tiny Christmas tree lights, and the crunch of snow beneath your boots. You are in Amritapuri in South India,. Amma’s home ashram. There are several thousand other people here to spend the holiday season with Mother, many of them Christians. You wonder: will it ever feel like Christmas Eve? Christmas? There are no signs of the season around. No mistletoe; no evergreen boughs; no red and white Santa Claus cards stuck on the bulletin boards; no green glittery letters strung across the entryway bidding everyone MERRY CHRISTMAS. You finish dinner, wash your plate, pick your spot in the hall-as close as possible to the chair Amma will sit in. You wait. Programmes happen whenever it is that Mother arrives; there’s no set time. You wait and look around, and see your first sign of Christmas: a small green tree occupies the Southwest corner of the stage apron, and it is hung with tiny decorations: handmade Amma dolls, Krishna dolls, Devi dolls, and a single string of tiny many-coloured lights. It was beginning to feel a bit like Christmas. There is a sudden surge of excitement and everyone jumps up…Amma is coming! No; not exactly. She makes a detour to the western canteen, where the café workers are still cleaning up from dinner, and are also preparing a special treat: Christmas cake. She goes inside, checks the pots and pans and garbage pails; She heads over to the newly acquired Cappuccino machine and watches while a cup is brewed especially for Her. Amma turns back towards the doorway-the path is of course now completely packed with people who have crammed in to enjoy this unexpected visit. But as soon as Amma’s intent is clear, a passage opens, and She strides briskly to the nearby programme hall. Wherever Amma walks, two apparently contradictory things happen: the crowd surges towards Her and She is engulfed, and a passageway appears before Her, maybe only 3 metres long and one metre wide, but it does open before Her, and She can progress to Her goal. when She sat in comfort on the floor impelled Her to forego that “self-indulgence”. Clearly feeling awkward and apologetic, She climbed up the ramp and sat on the high seat-and the grateful hearts of 100% of the people were convincing enough that now She goes obediently to this seat, passing up Her own preferences in order to-as always-give joy to Her children. No sooner had Mother sat than the small children began streaming towards Her. No; that’s not accurate. They couldn’t stream, since every inch of floor space was filled with people sitting close. But they climbed through, around, over-some were lifted up and handed along-till they reached Her outstretched arms. Many of the little ones jumped up close and kissed Her cheek; a few of the well-taught ones paused for a prostration before climbing up and kissing Her. To each little one, Mother gave a kiss on cheek or head, and a sweet, and occasionally some lucky child would end up in Amma’s lap for a few moments. Suddenly, the big new wooden doors on the stage rolled open, and there sat several of Amma’s western children. Guitars and harmonium-a reflection of the west/east mix that is this ashram-played together a song new to most of the people, but so easy that soon almost everyone joined in. It was an Italian song with only three words, and they meant, “Come, Lord Jesus.” For those sceptics who wonder whether Christmas can happen in an apparently Hindu ashram, here is the answer: yes. Soon, people throughout the hall-Hindus, Christians, Muslims, Jews, Buddhists-were singing together, “Come, Lord Jesus.” Amma says that the message of Jesus is love and compassion; in this, there is nothing at variance with the teachings of any of the true Masters, no matter what religion later descended from them. It was beginning to feel a bit more like Christmas. Amritapuri ashram is blessed with a Dutch resident who is an opera singer. This Christmas eve, she stood before her ashram family and Mother and sang three solos; two were familiar Christmas favourites. “How Beautiful are the Feet”, from Handel’s Messiah, praises the bringers of the good news of God’s Love; for Amma’s children, this aria took on a new dimension this Christmas Eve. Next “Ave Maria”, recalling the angel’s appearance to Mary to tell her that she would bear the Christ Child, stirred memories of home-and-family Christmases for many of Mother’s western children, residents and visitors alike. It was beginning to feel even more like Christmas. On Christmas, a few voices started singing “Lo, How a Rose Ere Blooming”; recognizing the melody, more singers joined in, with words from various European languages. As hundreds continued to come forward for their plates, the celebration continued, with one Christmas carol after another. It definitely felt a lot like Christmas. As you may know, Amma spends more than half of every year travelling across the globe, that all of Her children might see Her at least once a year. She has been everywhere from Reunion Island to Russia, from Singapore to Santa Fe, and of course to cities and villages big and small across the length and breadth of the country of Her birth: India. But of all these locales, one stands out: Kozhikode, a small city (by Indian standards) in Amma’s native state of Kerala. This year, Amma’s programmes at Kozhikode stretched from the 19th to the 22nd of December. The ashram there is home to one of the earliest of Amma’s Brahmasthanam temples, so the programmes there followed an impressive if by now standard daily schedule: five archanas per day, Amma’s satsang, bhajans, and hours of darshan both morning and night; and the Mars, Rahu, and Saturn pujas stretched over the final two days. And as always in Kozhikode, from the very first morning of programmes, even from the night before in anticipation of Amma’s arrival, the crowds overflowed from the darshan hall, winding back and forth in long snaking queues through the labyrinth of perpendicular wooden posts necessary to keep the crowds organized. 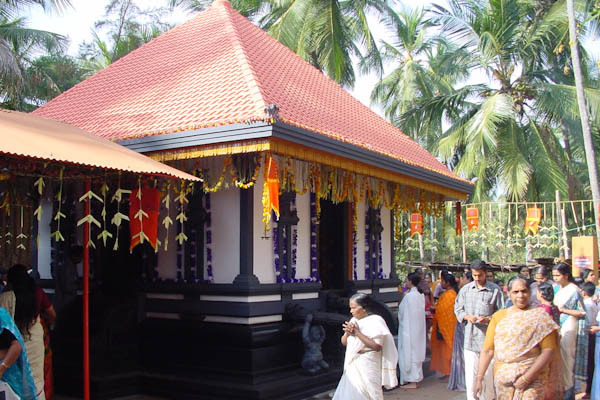 Which is not to say that they are a rowdy bunch—far from it, in fact, more than numbers of devotees, Kozhikode is known for the devotion which is so apparent in all the waiting faces, in al the hands eager to serve. Even at the peak of the programmes there, with more than ten thousand devotees waiting, from the earliest rays of dawn, under the hot sun as it travelled from one end of the sky to the other and on into the night, the overall mood of the crowd was one of patience, forbearance, surrender and devotion. Even at two in the morning, families could be seen lining up as far as two kilometers away as the crowd spilled out of the ashram grounds and onto the main road; and these not waiting for darshan that night, but for the day to come. And yet: person by person, family by family, from the tail end of the queue to those who had only minutes remaining to their darshan—which would, in most cases, last not more than two seconds—peace could be seen on nearly every face. Fascinated by this phenomenon, this writer, one of Amma’s Western children, set out to discover how so many thousands of people could be so patient for so long. I was assisted in translation by students of Amma’s Amrita Vidyalayam primary school which adjoins the ashram. We approached devotees at random, moving from the school to the kitchen where volunteers were chopping vegetables, to the tables where devotees enthusiastically sold Matruvani (the ashram’s monthly periodical) to the people waiting in the darshan queue. My young aides were unfailingly resourceful, patient, and careful in helping me to meet and interview these devotees, and discover the secret of their unique patience and overwhelming devotion. From the very first, and over and over again, we were given a single answer: faith, unshakable, undying faith in Amma as Guru, and in most cases, as God Herself. Trying another angle, we tried to present another question: What gives you faith? At this, we were often met with an odd look; a better question might have been: What could possibly shake your faith? Finally, we asked how these devotees’ lives had been changed after taking refuge in Amma. I had foolishly thought that I would have a hard time getting people to talk, and that I might have to really fish for answers, but the opposite was true: once started, it was difficult to gracefully end any conversation. One anecdote would immediately be followed by the question: Do you want to hear another? How could I explain that this was only meant to be a short article? And as I had from the beginning, I again felt remarkably unqualified to be interviewing these exceptional devotees. I felt as if I had been transported in space and time, to a place called Vrindavan, the home of Krishna’s Gopis. And I was reminded of a story from the Srimad Bhagavatam, which relates the life of Sri Krishna. It seems that once upon a time a messenger came to Vrindavan, seeking to deliver a message to Sri Krishna. This messenger approached a number of Gopis who were engaged in their work tending to Vrindavan’s cows. He asked the gopis where Krishna was. At this, the Gopis started laughing uproariously. This is the kind of faith and devotion that can be found, to a person, in Kozhikode. And it is what has made more than one of Amma’s children begin to think of it as Amma’s Vrindavan. Amma Herself said that many of Her children there had come only to serve. When the water ran dry, as often happens during Her programmes in Kozhikode, these devotees repeatedly cleaned out the toilets by hand. They did not have time to sit for the archanas, or hear Amma giving satsang or singing bhajans, let alone receive Her darshan. Going without food or rest, these children worked tirelessly to make the tens of thousands of other children feel at home while waiting for their turn to meet their Amma. Amma said that with each breath, those children had only one thought: “Amma, Amma, Amma…” Amma invited each of these true sevaks onto the stage, where each one got a chance to give Her the prasad to give to the devotees who came for darshan. These shifts, lasting two minutes each—sixty times the length of the average darshan in Kozhikode—must have been sheer bliss for those hard-working devotees. Q: How long have you been waiting in this queue? How much longer will you have to wait? A: “I arrived here at six a.m. If I have to wait till dawn tomorrow, it’s no problem. And if I don’t get darshan here, I’ll go to Mananthavady [Amma will hold programmes there in January 2002]. “I want only Amma, nothing else… We didn’t have a child. I asked Amma, and She told me to come with my wife. [When we came together] Amma said, ‘You will have a daughter.’ Now, we have a daughter. She is one year and three months old. …Before meeting Amma, we didn’t believe in Her. But after meeting Her, we are always meditating on Her. We have peace of mind. We don’t even want to go home. We want to be here [at Amma’s ashram] always. – I’m seeing Amma for the second time. I feel Amma is God. I’ve read Amma’s books, and after coming to see Her, I made Her my God. Amma knows everything. Now I pray to Amma whenever I have any difficulty, and I feel the difficulty goes away. A: While waiting in the queue, I am able to watch Amma on the TV [monitors stationed throughout the queues and elsewhere, showing Amma giving darshan live on stage] so I don’t feel tired, though I have been waiting for five or six hours and may have to wait many more. Q: Will you go for darshan? A: Even if I don’t go for darshan, it’s no problem. I always feel satisfied. Once when I went to Vallickavu [Amritapuri], I wasn’t able to get Amma’s darshan. But Amma sent prasad to Calicut for me, and others who didn’t get darshan. When I sleep, when I take a bath, when I eat, at every moment I hear Amma’s name in my ears. After meeting Amma, Vasanta began coming to the ashram to chant archana. Then she started coming for seva, chopping vegetables, helping to clean the entire ashram before Amma’s arrival. Throughout Amma’s programmes she was busily engaged in chopping vegetables. She was happy to be able to listen to Amma’s satsang and bhajans broadcasted through loudspeakers as she worked. And if wherever I went, people would rush towards me and call my name and want to touch me, it’s only natural that I would develop more than a little self-importance. But this is not how it is for Amma. Yes, the crowds gather, they respond to Her arrival with love and respect and reverence and when She is near enough, they call “Amme!” and try to touch Her. But if you watch Her closely, you will see that never does She respond as would I (and most of us): you don’t see pride nor arrogance nor self-importance. You see only and always humility and love. Take a few days ago, when She arrived in Kozhikode for the four-day Brahmasthanam program at Her ashram in this north Kerala city. People had been waiting for hours (because, you see, when Amma travels you never know whether She will come directly and fast-in this case, the journey from Amritapuri would have taken, at best, eight hours-or whether She might stop along the way to play with those travelling with Her, perhaps to sing, to serve lunch, to give satsang. You just can’t pin Her down to a schedule). So in Kozhikode the people began waiting even earlier than She could possibly arrive (I mean, you just never know! ), and in the heat of the day, they stayed ready. They worked, too, many of them: there were last touches to put on the temporary shaded areas in which thousands would find shelter from the sun under thatch roofs; bookstalls and incense displays and temporary STD/ISD (telephone) booths had to be set up; sleeping arrangements for Mother’s tour group (five buses full) and the many sevites who came for the four days had to be finalised…and more. So people worked, but also they waited. Waited and yearned and anticipated; they meditated and chanted, “Om Amriteshwaryai Namah!” in special anticipation of Amma, and the mantra that would be chanted during five archanas a day during the Brahmasthanam festival: “Om Sivashaktaikya Roopinyai Namah”. In quiet and orderly rows on the temple floor they sat. Waiting. Waiting for hours for an arrival scene that would last maybe ten minutes. They do this every year, too. There is something uniquely too beautiful about how Amma begins Her annual stay at Kozhikode. Once you have experienced it, even knowing how hot and dusty and difficult the wait will be, you wait. When Amma came, the great brass gong was sounded and the conch was blown; it was suitable for the arrival of royalty. But once you could see past the mob of press people, you saw just a small dark woman in a white sari, reaching out to touch the hands of Her children. Yes, She was wearing flower garlands-maybe six or eight; but something in Her demeanor showed you that She wore them not as proofs of rank but as tokens of love. The eagerness of her children to touch Her worried the ashramites accompanying Her, so they tried to create a sort of “zone of safety” around Her. Foolishness! For though it is true their efforts did keep the procession moving forward, in fact, for all their zeal and excitement, the Kozhikode devotees, well-coached by their crowd control team, kept their own ranks in order—it was just those arms, those hungry hands, those voices calling “Amme! Amme!”—and the irrepressible response of Amma who would move to this side, then that, stretching Her arms over the protective shoulders of Her attendants and across the clasped hands of the crowd control people lining the centre aisle until She could touch Her children. This was clearly not the regal procession of a monarch; it was the return of the Mother. Reaching the steps from the temple floor up to Her room, Amma paused and bowed Her Head to receive two more garlands, and then started climbing. Not too fast: at each level, She would look out across the sea of heads and hands to see the faces not seen before, visible only now, at this height. She turned away from the temple to look down into the yard where, come programme time, ladies and children waiting for darshan would be packed; now there were the overflow of volunteers and the earliest of the devotees (yes; they would sleep there, perhaps on newspapers or straw mats, to be first in the waiting area next morning). She gazed at them as a Mother gazes at her family after a long separation, and their faces glowed back with love. Upwards: up the steps and around the corner, to mount more steps. Gone are the days when She might take these last few steps to Her doorway alone: the photographers had gotten up there first, and so had some of the devotees. The entire area was packed. Still She did not hastily slip into Her room. No. The most amazing moment of the evening was yet to come. She turned away from Her room and towards the temple hall below. There on one of the lower steps of the balcony She leaned out to see Her children massed below. A roar from the crowd: “Amma!” Men’s voices, women’s voices, all mixed: “Amma! Amma!” or simply “Ma! Ma! Ma!” She stood there and looked out over all those faces, all those hands, and the only way to say what happened is: love poured from Her Face, Her Eyes, Her Self. As if to give physical form to this shower of love, She began stripping petals from the flower malas still nearly burying Her. She let them trickle down onto Her children; to be sure those not directly below were rained on as well, She hurled these blessings as far as She could. What did She see? A sea of faces, a forest of arms, a sunburst of brilliant smiles and flashing eyes: Her children’s love. For each handful of petals that descended, arms would stretch and open hands would reach and grab-there! A woman caught a petal and touched it to each of her eyes; a man caught petals and kissed them; another woman caught a handful and poured the petals over the child snuggled in her other arm. Mother removed the bedraggled garlands and laid them over the balcony railing. She stood there unadorned and just as beautiful, and continued to gaze at Her children. She leaned way down, so that She could see—and be seen by—those furthest back. A roar of appreciation and love from the distant ones. Then again, directly below: more calls of “Amma! Amma!” and She looked downwards again. They say that the open beaks of baby birds hungry in their nest essentially force the parents to feed them; just as irresistible to Amma were the open hands of the men and women and children—all Her children—down there on the temple floor. She took back the laid-aside garlands, stripped more petals, and showered more blessings down to their hungry hands. On Onam, Ram found Mother’s hand-washing basin on the table beside Her and proceeded to snort up a trunkful, spraying water onto everyone in the vicinity. He certainly delighted in the laughter and attention that ensued; but what he didn’t know was that he was actually beginning a new chapter in his life at Amritapuri. The very next night, and every night since then that he has had playtime with Mother, he has had another chance to play with water. The first time (after the Onam event) was, for the spectators, perhaps a bit disappointing. He drank from the plastic basin Mother held for him, but that’s about all. Everyone expected to see him spray, as he had done the day before. But he wasn’t in the mood. So Mother turned the tables on him: She took the bowl and emptied it on his trunk! Laughter all around! Since then, each night has had its own variation: sometimes Mother has only Her own water basin for cleaning up after hand-feeding him payasam (rice pudding). This water is sweet; he likes to keep it to himself. But most times, there is a big bowl of fresh water. Ram might drink it all up in one go, and then Mother will quickly refill it from a nearby bucket. Again. And again! One recent Monday night, She had a big bucket of water and a plastic mug, the same sort of combination most people here use for bathing. And bathing was, apparently, Her plan: one mugful after another She hurled at Ram who, at first, ran to the far corner of their play area, as if cowering, but soon came back close for more of the refreshing pleasure of being washed by his own Mother. Bathing wasn’t the only pursuit that Monday night, however. Ram decided on a new game: put the trunk into the mug (a fairly close fit) and blow bubbles! That was a big hit, with Mother and everyone around jumping and laughing. But then the mug was empty, and before Amma could reach the bucket and refill it, Ram’s trunk had found the bucket and was flapping around inside, splashing noisily. Mother filled the mug, tossed the contents on Ram’s massive baby forehead…and suddenly found his trunk slithering down along Her wrist till he reached the mug. He curled his trunk right around the mug and swept it from Her grip! Astonishment and feigned consternation played across Mother’s face, and all the watchers were laughing again-whether at Her expressions or his behaviours, only they know! This night, like so many others, was filled with laughter as the two, Mother and son, played at whatever happened to present itself. It’s true that Ram came expecting biscuits, and that Mother brought water expecting him to spray. But if, upon seeing no biscuits, Ram had hung his head in dull disappointment, or if, when Ram didn’t spray the water, Amma had sulked and retreated to Her room, then think of all the laughter lost! Mother doesn’t tell us not to plan events, nor even not to have expectations. It’s not the planning nor the hoping that creates problems for us, but our attachment to those plans and hopes. Ram and Mother are showing us how to let go of these attachments, how to be in the present moment; how to laugh more. Even last night, the ashram was awash with anticipation. Last minute preparations were concluded, brahmacharis and brahmacharinis returning from branch ashrams and visitors streamed through the gates, and everywhere could be felt a palpable sense of joy. Everyone knew that the very next day, their Mother was returning. By noon, brahmacharinis and devotees were gathered near the stairs to Amma’s room, some chanting the Lalita Sahasranama, some lost in meditation, some just anxiously waiting like little children. They knew that Amma had landed in Madras last night, and was flying into Trivandrum at 12:30 today. She was expected to arrive at Amritapuri by three o’clock, four at the latest. As the hour drew nearer, the crowds grew: the brahmacharinis gathering next to the stairs, the brahmacharis a step further away in the open air passage where many of them live and work. Some of the brahmacharinis inquired if Amma had eaten something. “I am eating love,” She replied. Amma would drive through this passage before parking in front of Her house. But soon, the lines stretched around the corner, past the new building being constructed adjacent the temple, spilling onto the steps of the temple itself and into the courtyard. And through the gates, beyond the flats, nearly to the road. The ones furthest to the road could be seen all the way to the temple, and everyone watched them keenly for a sign of Her approach. Yesterday, the temple bell rang, signalling the start of a scriptural class, and here and there a few people could be seen heading toward the temple. Today, about 3:30 in the afternoon, that same bell rang, and not only the brahmacharinis but the brahmacharis, the resident householders, the computer students, the Western renunciates and residents, and the Western visitors came running. They came from everywhere. From the flats, from the school hostel, from the shop, from the canteen, from the kitchen, from the temple itself-wherever they might have been, Amma’s children of every stripe rushed to greet Her. Footsteps pounded over marble and sand in a literal stampede of love and devotion, a tidal wave of humanity cascading toward the Mother of the universe. The bell did not lie: Shortly after it rang out, a car horn echoed its cry: Amma is here, here at last. Her white car made its way slowly through the throng of devotees: the driver careful not hurt the devotees who clearly had no thought for their own toes as they reached toward Amma’s outstretched hand. Amma Herself beamed with love for Her children as they did all they could to touch Her hand and arm, some burying their faces in Her open palm, reluctant to let go. The car slowly made its way toward Amma’s house, and whether they managed to touch Her or not, their faces lit up with joy, for all knew that if they weren’t graced with Her loving touch today, they will be tomorrow, or the next day, or the day after that. The car pulled to a halt before the steps to Amma’s room. With some difficulty a path was cleared for Her. She made Her way slowly reaching out to as many as She could, holding a hand here, brushing a face there, casting loving looks all around, as far away as the spiral staircase, overflowing with daughters, and the brahmacharis flats lined with sons. An elderly ashram resident performed arati to Her at the base of the stairs, and even when She finally began to make Her way up to Her room, She paused halfway and surveyed-with love, affection, and something like satisfaction-the sea of Her children before Her. Catching sight of a Western renunciate who was videotaping the scene from afar, Amma called out to her. The crowd parted for this woman who routinely tapes Amma and scenes around the ashram. Now, the tables were turned: upon reaching the stairs, Amma gently turned her around and asked Her to film Her children. Many shouted for Amma to come down and join the picture, but Amma insisted that this time, only Her children be recorded. Amma Herself, eyes on the camera’s viewfinder, guided the camerawoman’s hands, Her other hand on her shoulder, the way a mother helps a child to ride a bicycle, or trace letters in the sand. Amma leaned this way and that, making sure to capture each and every child on tape, even leaning low to capture the brahmacharis on their balconies. She said that She wanted to be able to see all these faces whenever She wanted. The camerawoman looked overjoyed beyond words to suddenly have Amma on the other side of the lens, to be able to share this dance of recording with Her. Amma also called another renunciate who frequently takes still photos of Amma. The photographer focused the camera, Amma making sure that she was getting everyone in the frame. Then, when the picture was perfect, Amma reached around and snapped the photo Herself. The moment captured forever, Amma slowly retreated up the stairs, bearing a look of great reluctance. After seven weeks of embracing Her children around the world, after a two-day flight from America, after making Her way through the crush of love-struck ashramites, no one begrudged Her taking a rest. But as is Her way, even now She must not have closed Her eyes. Surely there were disciples waiting inside Her room with important questions, urgent decisions to be made, and as always, letters to be read. One things is certain: for the over a thousand children here at the ashram, their feeling is one: their Amma has come home. Wherever Amma travels in the world, the basic shape of Her programmes is the same: She generally arrives by car, stops briefly at the entrance to the venue for the traditional Indian cultural greeting for respected persons (a pada puja and a garlanding), then walks down a central pathway lined with the people who have come to meet her. Upon reaching the front of the hall, She turns to greet the crowd and then, first having prostrated to the Divinity she sees in all of them, She takes her seat and begins the program: meditation or satsang. The publicity always announces that Amma will give a program of meditation, satsang, bhajans, and then darshan. The publicity never, of course, mentions that she will arrive, nor that she will leave. Well, that is obvious; it goes without saying. But as a matter of fact, for many devotees the arrival and the departure are favourite parts of Amma’s programs. Why? First there is the anticipation: people stand near the door, and form an aisle all the way to Amma’s peetham (seat) or to the steps to the stage. Right near the door there is spread a lovely piece of cloth, perhaps silk, or a soft special carpet; beside this there is a tray with flowers and petals, a small container of sandal paste and another of red kumkum. There is a small vessel of water—in November in Europe and America, it will be by some fortunate person’s cradling it in loving hands and keeping it close to the heart—for washing Mother’s feet. On the opposite side of the cloth or carpet will wait another member of the welcoming party, carefully holding ready a garland she or he has helped prepare for this special ritual. All around, softly, there will be the murmuring of a mantra: Om Amriteshwaryai Namah. It is a slow chant, and the atmosphere grows quiet and peaceful; minds are tuned to the reality that soon Amma will come. There is someone outside the hall, watching for the car. It is sighted, a signal is given, and inside everyone knows Amma is almost here because the pace, the pitch and the volume of the chanting suddenly increase. The car pulls up close; someone opens the door, and Mother steps out. The first thing She does is to bend and touch the ground; She glances around as She begins to cover the few yards to the doorway: there is someone in a wheelchair, and She bends to kiss him; here is a child holding a stuffed dragon in one hand and a flower in the other: She pats her head, or perhaps suddenly scoops her up into Her arms and moves forward. Just inside the door, She pauses, and the people granted this cherished opportunity perform the pada puja. She stands still, simple, humble, Her hands folded (unless the child She lifted has remained in Her embrace, as occasionally happens!). Her eyes are closed, Her head slightly inclined downwards. The ritual ends with an arati, and already She is scattering petals—perhaps She has plucked them from the garland just placed around Her neck, or perhaps they come from a plate of petals someone has held near. Amma showers these blessings on the heads of those who were involved in the ritual, and then perhaps tousles the hair of one and teasingly pinches the cheek of another; solemnity is not a requirement despite the reverence embodied in the pada puja. Mother sees someone off to the side a little, and hurls some petals at the unsuspecting target. Chortles of delight from Mother, when the surprised recipient suddenly tries to catch the well-aimed prasad. Amma begins the trek to the front of the hall, and what began as a wide aisle becomes at best a narrow passage. Everyone wants a touch, a smile, a pat, a glance. Mother cannot be said to process to the stage. She walks among Her children, pausing to question this woman, to pat the bald head of that man, to kiss (and perhaps offer Her cheek for a kiss from) a child in someone’s arms. She reaches back the depth of three people to touch a yearning (and now startled!) man who had given up hope of contact. This is how it is all the way to the front: Mother’s laughter and smiles, Her children’s delight. Amma arrives at Her peetham, steps up the couple of inches onto it, looks out over Her children, raises Her hands above Her head in the greeting one gives to one’s superiors—for Her children embody God and then kneels and bends to touch Her forehead to the carpet. For those who see Amma as an embodiment of the Universal Mother, or as a Mahatma or as a saint, this humble gesture is a graceful reminder that God is the Servant of all. Then there is the program, as promised. And then there is the departure. You couldn’t call Amma’s arrival a processional, and neither can you call Her departure a recessional. She has been sitting perhaps for six or eight or ten hours, hugging, counselling, joking, consoling. The rest of us have probably left the hall for a meal or at least a snack and a cup of coffee, and probably a visit to the rest room as well. She has been only sitting, embracing, and blessing. Wouldn’t you think enough is enough and She might make Her way swiftly to the waiting car? You’d be mistaken. She starts to stand, sees a few hesitant people off to the side, devotees who refrained from darshan today because they saw the size of the crowd, and wanted to spare Her body. She makes eye contact, gives a quick nod of Her head, stretches Her arms out, and sits back down for another few hugs. Then She really does stand, but She doesn’t walk far, because the woman kneeling nearby is irresistible and Amma draws her close, pressing her head to Her stomach, stroking her hair, and at the same time calling out a teasing scolding to the young man just beyond them who hasn’t, after all, stopped smoking. There is an ashramite standing nearby now, holding a tray of prasad. Mother takes a Hershey’s Kiss (that’s the traditional sweet for the American tours…Kisses and Hugs, naturally). She presses the foil-wrapped chocolate into the hand of the girl in Her embrace. Then Her hand goes right back to the tray and closes around at least a dozen more Kisses! The handing out of prasad is only one task; Mother always likes to do several things at a time, so though She continues dropping chocolates into open hands as She makes Her way to the door, She also manages to stop and play with a baby, refusing to move further till he kisses Her not once but three times on the cheek! She moves along a few steps and pauses to ask one of her sons how his hospitalised wife is doing; a few more steps and She pinches a teenager playfully, giving instructions in clear English: “Study, study!”. More steps along the way and a woman who has been crying finds a soft brown hand wiping her tears and caressing her cheek for a brief moment. A six-year-old child escapes her mother’s grip, barrels down the aisle and hurls herself against Mother’s knees. “I love you!” the girl shouts, and Amma grabs her shoulders, playfully shoves her away and pulls her back a few times. Just before the door, almost where the pada puja happened when She arrived, there waits someone with Her shoes. This is usually a bald or balding man; Amma likes to drum playfully on a bald pate while its owner is coaxing Her to step into Her shoes. Actually, there are no rigid requirements about either baldness or gender; whoever the lucky man or woman is, he or she ends up with a special darshan as Mother, hugging (and maybe drumming! ), stands a while, gazing around at all Her children so reluctant to see Her leave. Perhaps She chats a little more with some of the Malayalam speakers near the door before She exits. Is it over? Not quite. The distance from the door to the car requires a few more pieces of candy, some more touches and glances…and at the end, a final hurdle: to get through the press of little children around the car door, calling out “Amma, take me!” and “May I ride with You, Amma?” and “Please, Mother!” She squeezes past, sits in the car, looks back at the little ones, and sometimes relents: at such a time, She scoots over and calls one or two or perhaps even more into the back seat with Her; all cuddle close for the ride to the house. Whether the children manage to hitch a ride or not, once the car door is closed, the window almost always opens, and Mother’s small hand stretches out. Slowly the car inches away from the curb and—here in San Ramon—heads down the hill. There is a sort of undulation in the line of people as Mother’s children, big and small alike, lean forward to touch Her fingers as She passes, and then step back. At the bottom of the hill, the car still doesn’t speed up, because the kitchen crew has come out to have a glimpse of Amma—perhaps their only one this day—and She wants to touch them as well. “Seva, seva,” She calls out approvingly; their selfless service pleases Her, the Servant of all. At last the car speeds up, people watch till it is beyond the gate and then around the bend. They trek back into the empty hall for their bags and blankets and folding chairs. Fire-fighters come for darshan. They asked Amma to pray for their fellow fire-fighters in New York. Even before nine this morning the queue was long — it stretched for perhaps 200 metres from the entrance. Yet, at that same hour, the hall was already half-full. By Amma’s arrival time, the hall was full — and the queue just as long as it had been. This is Europe; Paris; since it is All Saints’ Day, many workplaces are not open. This is a boon for the people here who take their work commitments very seriously and yet would have wanted to be here for Amma’s first day of programmes. They are here, perhaps already two thousand, ready to spend the day, and most of them the night as well, sacrificing the “personal space” expectations in this society and sitting packed close to strangers, most of them on the floor, in this huge meeting hall. What’s the draw? It is the small woman in a white sari, sitting in a chair at floor level, barely visible to most of the people most of the time. She will sit for as many hours as it takes to embrace each person who comes to Her, to whisper “Ma fille cheri,” or “Mon fils cher,” or perhaps “My darling daughter” or “My darling son,” or the equivalent in Tamil or Malayalam or Hindi. It’s true there is a small group of people sitting on the stage behind Amma, singing devotional songs, accompanied by tabla, harmonium, electronic keyboard, the more traditional handbells, occasionally a flute. Their music is lovely, but it is not the draw: it is the background. The draw is Amma giving darshan as She does everywhere in the world: hugging, whispering, listening, smiling, wiping someone’s tear and perhaps shedding one Herself as She shares in Her children’s suffering. There is a woman alone, holding a picture of a young man and woman and, obviously, their first-born: her grandchild. She puts the little family into Amma’s hand and nestles close while Amma touches each face in the photo with sandal paste. The woman wasn’t so alone after all. Here is a crowd! Two young girls, behind them two preteen boys, then a mother, a father, and a matriarch — you can tell by how she shepherds the family into place and keeps a proprietary hand on the mother’s back. Once each has been kissed all are drawn into one large hug; see how Amma’s fingers “walk” along the shoulders of the farthest boy and draw him closer, and then stretch a little so as to be touching two people at once: all are being touched, embraced. Next comes a bold, fiery teenager whose spiked hair is orange up to the tips, which are green. He is at home in the all-welcoming lap, which, once he leaves, welcomes as readily a grandmother — no, a great-grandmother, no doubt — in a demure grey suit and a single strand of pearls. A plate heaped high with fruit, sweets, a split coconut, and flowers is held towards Mother: an offering from one of Paris’ two Hindu temples, one dedicated to Vinayaka (Ganesha, Remover of Obstacles). The priest and his assistant offer dakshina to Amma, and a stack of magazines about their temple; a crowd of members of the congregation, many Tamils, comes forward for the darshan of the visiting saint. Two middle-aged professionals approach. She hugs the first one, who is dressed in the impeccable style of a banker. A pinch on the cheek, prasad, and Her arm reaches out for the friend. Casual in golfer’s slacks and a V-neck pullover, this one too is welcomed to Her embrace. She draws both close at once, scatters petals, kisses their hands, and they move aside. The sticker on the blouse of the next woman tells Mother this is her first darshan. Nonetheless, she must know something of Amma’s universal outlook on religions, for in her cupped hands, she is bringing Amma a rosary, its silver crucifix shining. Amma kisses the rosary, touches it with sandal paste, and holds her new daughter close. A German family comes, looking reminiscent of “The Sound of Music”: a mama in a dirndl, a papa in lederhosen, sons in shorts, and daughters in full skirts. Blond hair, rosy cheeks, and an armload of delicate wildflowers. Then comes a man who has clearly seen better days: patched jacket, soiled neck-scarf, the smell of cigarettes and cheap wine, three or four days’ grey stubble. She pulls him close and holds him a long time, rocking, gently moving Her hand up and down his tired back. His eyes show a kind of surprise when he pulls back…and more surprise when She draws him close again for whispered word and a kiss. An African father with his three children approaches; he has tribal scars on his face, but the children do not. They are holding a photo — is it their mother? Amma looks, kisses it, kisses them all and draws them into Her lap. She hands the photo to the father and showers it with flower petals. A much-loved daughter and her parents come: the daughter is in a wheel chair, and her mother has been sitting beside her, stroking her forehead, making loving yet shushing gestures whenever her child would start to make moaning or crooning sounds. The daughter may be twenty or thirty, it’s hard to tell; she is severely retarded; the peace shining on both parents’ faces is inspiring. When Amma leans forward to hold the daughter, a look of recognition crosses the girl’s face; the family has been coming to Amma for years; the love is familiar. Accompanying the family is a gentle golden retriever, who also knows the procedure: it sits quietly, watching Amma’s hand. When She stretches forward with an unwrapped sweet, it is gratefully gobbled! As the family leaves, Amma’s affection for the dog overflows; She calls it back for a second sweet and some more pats on the head, after which line monitors are needed to persuade the gentle animal to leave Amma and return to its duties. A family of three, he bearded and in a turban, she in a long black dress, their child in jeans and a Winnie-the-Pooh shirt, comes to Amma with a box of home-made sweets; they ask for blessings for their family back in Afghanistan, and Mother holds them all close, promising that She will pray for them. Back a bit in the line is a child of two — just the age for curiosity and insecurity. She is stretching to see this brown lady everyone is moving towards, but as they draw closer, she retreats to her mother’s arms and peeks from behind a large and bushy bouquet. Her hiding place disappears as the flowers are handed to Amma, and she shrieks! Without a blink, Amma is holding out a bright orange-wrapped sweet to the child, who manages to see through her tears and decides to take a chance. Amma hands her the sweet and swoops her close for a quick kiss. She squirms free and stands back watching doubtfully (while unwrapping the candy) as her mother is hugged and rocked. Deciding it must be OK, she sidles closer — and is handed yet another sweet! Here is a Christian monk who hands Amma a carefully written letter. The translator standing nearby puts the question into Malayalam. “Okay!” She says with delight, and pats his balding head. “Okay! You come.” He had asked whether he might move to Her home ashram, Amritapuri. Suddenly, all together in the line, there are six people in white — the colour people who’ve known Amma for some time often choose in order to signal a bond with Her. They have known Amma for ten years; when She’s not in Paris, they meet weekly to share prayer and bhajans, maybe a video, a meal — and memories. Now they’ve come for their annual hugs. Amma’s eyes light up with recognition and this one She teases, that one She condoles, a third She scolds, a fourth She listens to carefully, nodding from time to time; another She holds close, almost lets go, and then pulls close again, and the last one She laughingly chides, pantomiming smoking a cigarette… each is remembered, each uniquely greeted. Blue jeans, a down vest, T-shirt sleeves rolled up, a chain hooked from his belt loop to his back-pocket wallet: this tough guy has a white and yellow daisy in the tattooed hand he stretches out towards Amma. She takes the flower in Her hand and his head in Her lap and whispers. When he lifts his face, She bends to kiss his hand, and he kisses Hers at the same time — they almost, but not quite, bump heads. Quiet and composed, a Japanese woman holding a delicate flower arrangement and a picture of Amma makes her way forward, bows halfway as she moves toward the welcoming lap. Amma chuckles softly and bows slightly Herself, remembering the custom from Her Tokyo visits. Then there is the warm embrace, another small bow, and the woman moves not far, to sit at the side and watch. “What kind of people come to you?” a reporter asked Amma not so long ago. Then, as always, the answer was the same as on this All Saint’s Day: all kinds. Amma says She sees Herself in each of us; “All Saints’ Day” has a new ring to it. Amma leaving the hall after a long darshan in Paris.